Clean air is crucial to the survival of nearly every living organism on the planet. Because of our tendency to burn fossil fuels, use inefficient means of transportation, and utilize methods of industrial production that release large amounts of sulfur and carbon monoxide, our air is in bad shape. More significant than the ‘dirtying’ of the air are the health consequences that derive from it, health consequences which everyone on Earth has to be aware of. Charlotte has been doing a reasonable job of reducing their air pollutants, but we need to continue our efforts. Success depends on all of us making a concerted effort to conserve this important resource! Registered Vehicles – The total number of on-road vehicles registered in Mecklenburg County. This data is plotted on the graph with blue bars, along with a dotted blue trend line. Vehicle Miles Traveled (VMT) – The average number of miles traveled each day by on-road vehicles in Mecklenburg County. This data is plotted on the graph with red squares connected by a line, along with a dotted red trend line. The graph above shows that average daily VMT and the number of registered vehicles in Mecklenburg County have both increased over the past decade. 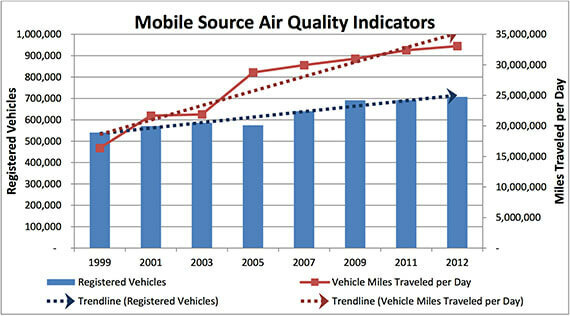 However, the trend lines on the graph show that VMT is growing more quickly than vehicle registration. This indicates that the average Mecklenburg County resident is driving more each year than the year before. The amount of air pollution generated by a single car depends on how clean the car’s engine runs and how many miles the car is driven. Newer models of on-road vehicles continue to be built with smaller and typically cleaner engines, reducing the amount of air pollution emitted for each mile driven. Unfortunately, the trend of driving more miles each year could reduce or even eliminate the air quality benefit from having cleaner cars and trucks on the road. Citizens can reduce the number of miles they drive each year by “trip-chaining,” combining errands into a single multi-stop trip rather than multiple single-stop trips. Drivers can also replace car trips they would normally make alone with a “cleaner” alternative, such as carpooling, biking, walking, or using mass transit. 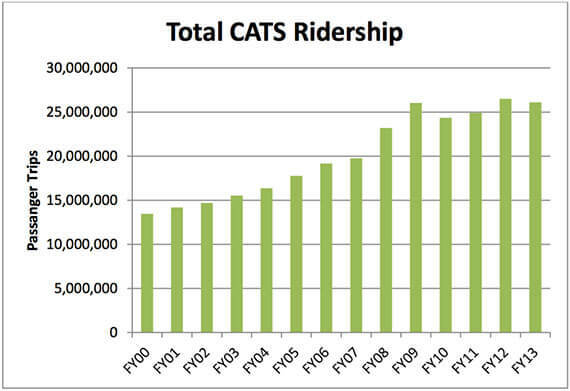 The graph below shows that an increasing number of residents are turning to Charlotte Area Transit System (CATS) services as an alternative to driving alone. Carpool, bike, or take public transportation while commuting. Telecommute when it is at all possible. Plant trees, or get involved in operations that do so, including Trees Charlotte. For a list of additional resources to help individuals reduce their impact on air quality, visit NC Air Awareness. For more information on Air Quality Index (AQI) and local air quality forecasts, visit Charlotte Air Awareness.